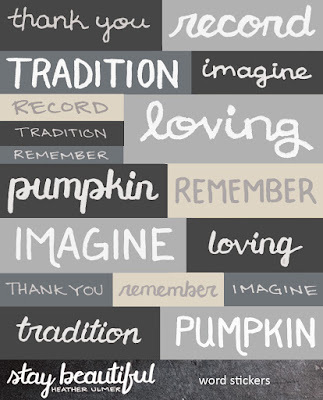 This week's Just Print It project is a fall card! The process video (currently uploading) at the end of this post shows how I created it using my original "Word Stickers" printable and in this post there is also a second bonus card! I am calling the printable "stickers" even though technically they are just a cut apart. I chose to print the file on kraft cardstock and it turned out great! They look more brown on the print out (even though the design is shades of grey) and when I added Glossy Accents on top, they turned even more brown! You could also print directly on sticker paper or run them through a xyron sticker maker. On another note, please also check out my giveaway post for details on how to enter! 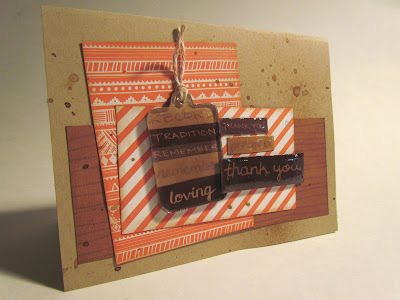 I had a fun time creating this word tag using a Tim Holtz fragment piece. It is a unique way to use pattern paper or other little scraps. The orange pattern paper I used is My Mind's Eye from the Jubilee collection. The wood grain paper is October Afternoon from the Weathervane collection. 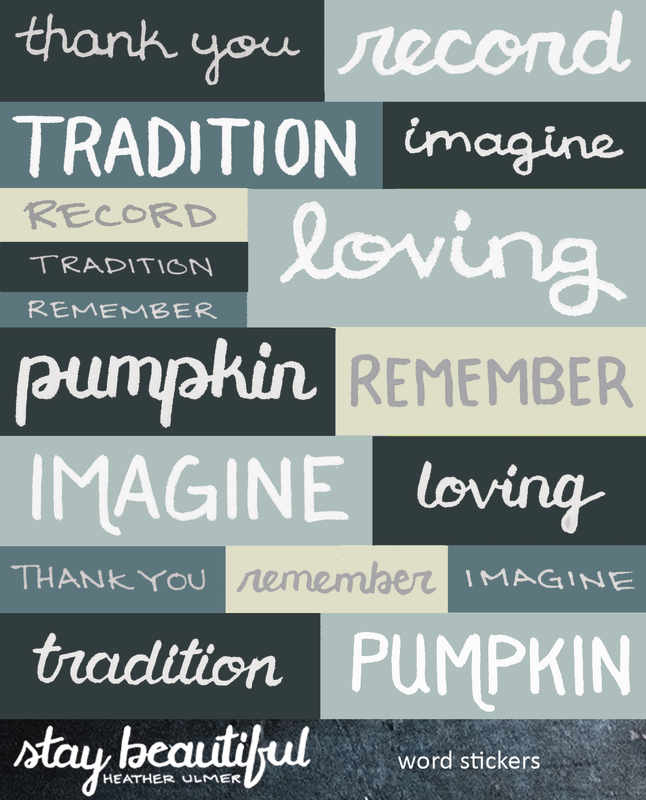 Here is the second BONUS project using these word stickers. I created this one for a close friend because it is her birthday today! her favourite word is "imagine", so these word stickers were appropriate! The ruffled background paper is, again, My Mind's Eye from the Jubilee collection and I just layered it with some die cuts and paper scraps. 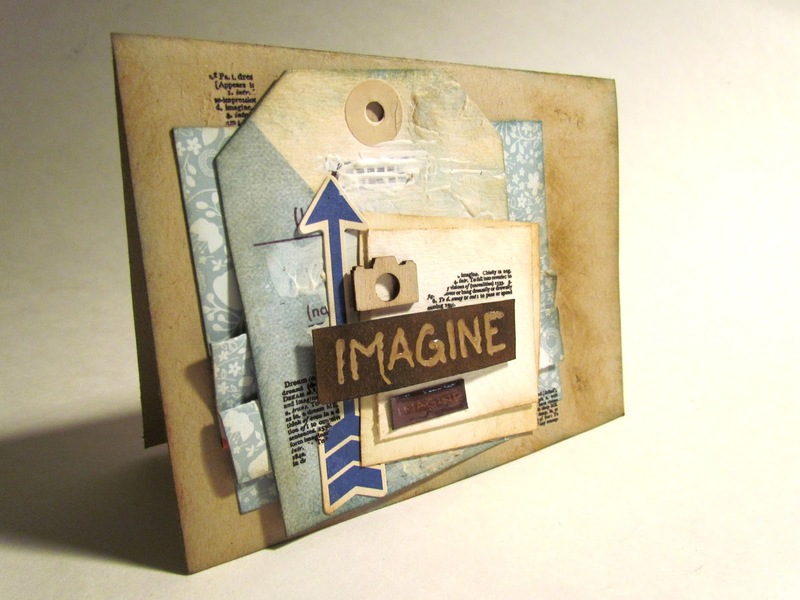 I outlined the word "imagine" with Glossy Accents and, after letting it dry, added some ink to create a resist effect. I included a few of the words inside too, just to add interest. Thanks again for stopping by! I hope you have a chance to enter my giveaway! The deadline is fast approaching, so get your printables printed and on a project of your choice!